Politics, like cricket, is a game of glorious uncertainties. Yesterday, your guard was virtually impenetrable and you look set for a very long innings indeed at the crease. Today, someone you thought was on the same side might choose to run you out in a cavalier act of insouciance. Tomorrow, if you’re still in, in the side, and available for a second innings, you could return the compliment with a corresponding coup: insouciance for the goose is insouciance for the gander. That’s politics. Politics, unlike cricket – or, at least, unlike the cricket that the last gentlemanly generation grew up to, and with – is also a game of inglorious certainties. Yesterday, as you crossed over for a cheeky single to win the match, you were determined to change the nature and the destiny of the game. Today, which seems like only yesterday, when all our troubles seemed so far away, the crowd cheered you on and were definitely on your side. Tomorrow, which is yesterday’s day after, you appeal to the third umpire – yourself – and bring back to bat the men who were declared out by common consent. That’s also politics. In the background, your new sprinting partner beams with approval, because it is one of his boys who’s being brought back in from the cold – even though his side swore they wouldn’t. The match referee – which is civil society in general and a coterie of political pundits in particular – is down in the doldrums in the dressing-room… especially since they thought you wouldn’t stoop so low. Your fans in the pavilion are strangely muted – experiencing some dampening in their enthusiasm, like a Duckworth-Lewis game on a monsoon day. It isn’t cricket, they mutter sullenly but impotently. After all, they’ve no choice now: they’ve bought the ticket to watch you play, purchased a souvenir to track your records, settled down with snacks and drinks and the traditional paparé band to watch a good match. And now it’s taken an unexpected turn in the opening overs, while the new players are settling in. Of course, it isn’t cricket (with voting being the ultimate spectator sport) when the head umpire asks the men who were out to come back in and bat again. When the crowds and the big tent clearly wanted them out! Or is it cricket? At least the kind of cricket that passes for politics now that the noble practitioners of the game have all but retired? For where are the likes of a Sanga – competent, tactful, sensible; above all honourable – to play a straight bat when the pitch is queered? But let me stop pussyfooting around, like many politicos are wont to do these days. This is about the bad taste in the mouth that has been left behind, for aficionados of ‘romantic politics’ to savour, in the aftermath of national-list manipulations and machinations. We thought ‘good governance’ would be better than this. Its proponents would not dream of asking those whom the electors voted out to come back in through the back door. Would they? Would they justify it so blatantly, if at all? That politics – the art of the possible – makes it necessary that former political opponents and some folks outcast by the people are necessary to make coalition politics – the art of the pragmatic – practical and practicable? But if you had been thinking in terms of ‘realpolitik’ instead of ‘romantic politics’ (AKA ‘cricket’ or “the gentleman’s game”), none of these developments would have come as a surprise – much less a shock. And if you think the ‘good guys’ are doing something unconscionable in attempting to smuggle in the likes of say, a Rosy, spare a thought for how ignoble some quarters might perceive an, uh, SB, coming in as a substitute for the likes of a, er, GL. Perhaps the irony is not lost on those who said they would vote for the JVP – as they always say until the last minute that they will vote for the JVP: that ‘principled party’ – and usually don’t; and didn’t this time either. Maybe the irony is lost on those who said they would not vote for the TNA – as they always say until the moment is almost past that they won’t ever vote for the TNA: that ‘nationalist separatist movement’ – and then do; or did. At least these parties deserved their seats in the House. Their members who came in by dint of the national list did so by virtue of their principled campaigns and proven character – rather than by dubious virtue of backroom deals and spurious electoral-system analysing logic. In the meantime, there’s an unhealthy goulash of political expectations on the one hand and the voters aspirations on the other to sort out (at least, for anyone interested in ‘civics’ – while government tries to sort out ‘governance’). On the one hand, the dominant political mood was that this was an opportunity for the polity to rid parliament of a raft of rogues. If that is true and is to hold good, and the people voted and the people voted out the bad and the ugly, what right do the good now have to bring back in some of the bad and the ugly? On the other, a corresponding motif among the more conscientious demographics of the electorate was that here was a chance to partner with clean politicians to usher in a new political culture. If that is logical and rational enough to risk voting for, what right do we now have to quibble with the new ‘political culture’ (read ‘same old apolitical subculture’) that is reinstating the runners-up whom we rejected? It’s neither good politics nor good governance, but realpolitik pure and simple – although realpolitik is rarely pure and never simple. That’s the unromantic side of civics. More to the point, I meant to ask: Where have all the good men and women gone… The ones who protested (perhaps too much) that good governance would ensure a new deal, the best social contract between government and civil society? ‘Small’, ‘efficient/economical’, ‘accountable/clean/transparent’ government being the guaranteed order of the day! Could it be that they are happy with the circumstances which are now emerging that we must live with for at least another two to three years? Is big government in our country’s best interests now? Would it be worth for the subscribers to good governance in parliament to cut deals with saboteurs and subversives who expect ministries and mandarin-ships for the price of cooperation in a coalition government supposedly committed to reform? Let’s not kid ourselves about national government, folks – there is neither cause nor mandate to claim the name or stake the polity’s peace of mind on it. It’s just realpolitik all over again. The past decade has been one in which we – first war-weary, then peace-drunk, and not a little afraid of state terror – succumbed to the soft whisperings of Growth, Development, Prosperity (a GDP mantra that many governments adopt). And were seduced by the dark side of an initially at least somewhat benevolent tyranny. Now it looks as if the next two years at least will be a much more but still compromised benevolent oligarchy in which ‘national government’ means precious little in terms of accountability to the people. It simply means that while there is still a strongly comforting separation of powers between the three branches of government (executive, judiciary, legislature), there is also the strangely discomfiting symbiosis of three trunks of the executive-legislative part of the government-tree (chief executive/cabinet, cabinet/government, governing coalition). That’s not democracy, it’s an antisocial contract. 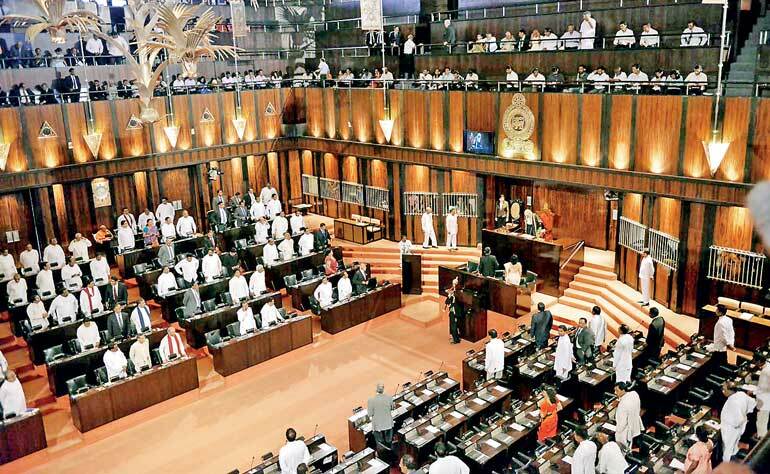 And the clear-witted, strong-willed, principled parties in the House – that unwitting, unwilling, band of brothers: the TNA and the JVP – will needs must serve as the main opposition. That’s one of the ironies of realpolitik: that defenders of their party’s faith at two ends of a nationalist spectrum must take up the mantle of defenders of the people’s faith. Is this what we (read you and I, my dear readers of this rag) voted for – honestly? For the UNP that it might woo the ragged remnants of its arch-nemesis, even to the extent of sucking the SLFP out of the UPFA, and forming a symbiotic uni-party in parliament that is potentially a United Front AGAINST Good Governance? That an SLFP President might continue to play ducks and drakes with a coalition of which he is no longer a happy chair? a party at sixes and sevens of which he is still the grudged leader? and a rag-tag motley crew of a government that he has to struggle every day to keep on the straight and narrow if it is to deserve its epithet of being a United Front FOR Good Governance? Whose interest is good governance really in? The people’s? Just that of what now seems like a nicely blended camouflage-majority in the House? Happy day that we saw the last of the possible return of a certain man, a corrupt but powerful machine, a crippling chauvinistic movement, that would lord it over us all again and ditch democratic-republicanism in the trash-can of a post-terrorist state (or state-terrorist position). However, it might be democratic-republicanism itself that ends up in the dustbin of contemporary history – if we’re not careful. I’m saving my breath for the rest of what promises to be an epic rant – if and when a ginormous cabinet emerges from the rubbish dump of rejected legislators among others. So if good governance has any self-respect left, it would think long and hard before it foisted a fiasco of a fat (and potentially fat-cat) cabinet on its loyalists. Us. Local government elections to put into place over 450 superfluous pussyfooters is not as far off as we’d like to think and hope. Spare us and yourselves of some major grief in the meanwhile and Think Small. Think Smart. Think Strategic. Maybe there’s more merit to it than immediately meets the eye that in politics there are no permanent friends or enemies. So go easy on handing out those ministerial portfolios. Which could backfire on you, the elected, come August 2017… in the same way it has put paid to our dreams of a nice, tight, small, round, cabinet of under 25 in August 2015. We thought we had won the election when the losers who were the political-retreads (I almost wrote ‘retards’) were well and truly rejected? Looks like we were just the runners-up; and the large national unity government of winners and losers are the real winners – and losers.